Bacon Cream Soda, are you good enough*? I didn't even know they made a Bacon syrup. Tiny Weirdness bells began to ring in my mind. The possibilities...! What hideous chimera-like creations could we produce with a bacon-flavored soda syrup? And more to the point--if we, the staff of the Weird Soda Review labs, didn't make them, who else would dare? Plus, Google searches for "soda reviews" invariably return reviews of Primus's album "Pork Soda". Just imagine...if we dare this feat, we will have actually made a pork soda! We must do this. We MUST. But how? What can we use as a base? And then it hit me. We must use the pinnacle of sodas--a cream soda--for this creation. We shall create a Bacon Cream Soda! An early attempt at this mixture was distributed yesterday to a group of unsuspecting victims volunteers playing Order of the Stick at the Lab. Their responses varied between horror and disgust to a certain bemused disdain, tinged by nausea. Worth noting is that not one of them finished the serving they were given. Some ended up poured down the sink (effects on the sewer system, treatment plant, and employees thereof are still under investigation), and I suspect there may have been a certain amount of discreet smuggling to the toilet. Some was even offered to the Lab dogs, Freya and Flitwick. The dogs turned it down after a single sniff, despite the fact that it smelled like bacon. This can only be considered an unqualified success. Several days later, after a suitable lighning storm to obtain the 1.21 gigawatts of energy needed for the fusion, and the establishment of new sodahazard level 5 precautions at the Lab, I am pleased to report (with singed hair and a wild-eyed look) success. It has been created. It waits on the table, in a small cup. The first Bacon Cream soda ever created at the Lab. To accomplish this, I mixed five parts Zevia Cream Soda with one part Torani Bacon Syrup. And now it shall get its due--a proper review. 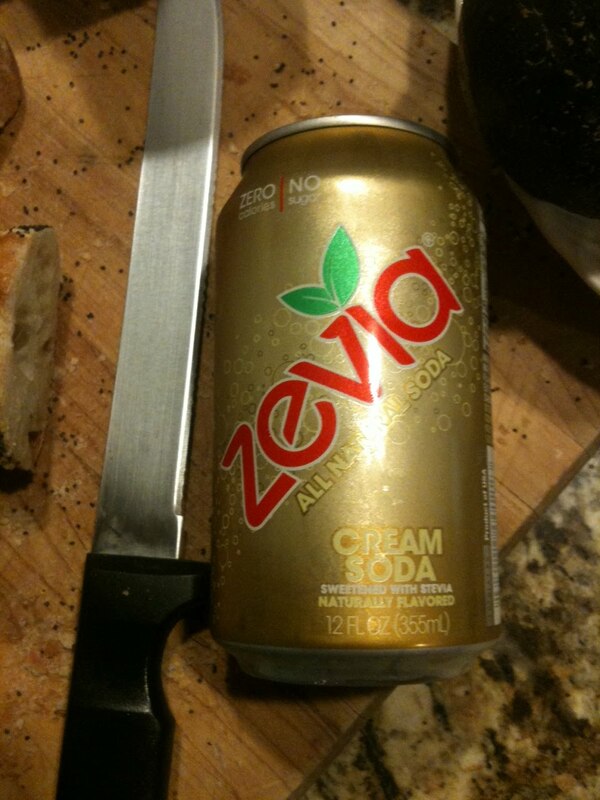 Where and when: The Zevia was obtained from Whole Foods. The Torani syrup came from BevMo. The idea arose from N'kai, in all likelihood. Color: Disturbingly fizzy, significantly more than the usual Zevia. Dark amber, ever-so-slightly cloudy. Glistens eerily. K-i-C: "It is actually amber. As in the color of amber." Scent: Just sitting here with it on the table in front of me, I am detecting a disturbing scent of fried bacon. It's actually pretty accurate--maybe slightly sweter than the real thing, but otherwise, highly reminiscent of actual bacon. The fact that it is two feet away from me is impressive; I'm not sure I've ever detected the smell of a Weird soda from this distance. K-i-C: "Smells like Der Waffle Haus." I note with approval that she is likening the smell to a fictional diner featured in "Dead Like Me". Clearly, our creation is eating away at the barriers which separate our sane, rational universe from its own imaginary creations. Taste: I'm not sure if I hate it or love it. The bacon taste is extremely strong, almost overwhelming. At this point, I should really take a moment aside to offer Torani my sincere congratulations on the creation of an accurate bacon syrup. What other havoc can be wreaked with this? The bacon has transmogrified the sweet, slightly acidic vanilla of the Zevia into a maple-ish vanilla hybrid, which twines itself along the bacon. The two mix in a remarkable way; a vined scaffold of sweet/salty breakfast soda emerges, hung with glistening pods from which pork fat gently drips, to fall sizzling onto a sweetened griddle. Another sip. I am astonished; it's actually good. Quite good. The worst part is the smell just before you sip; that's mostly bacon, which clashes badly with the expectation of a soda. However, once the soda actually hits your tongue...it's almost nice. Better than the Tofurky and Gravy soda, at least. K-i-C: "It's true, it smells worse than it tastes. The aftertaste is..."*reluctantly*"...actually pleasant. " K-i-C: "It's got that fake sugary feel." She smacks her lips and grimaces in disgust a few times. K-i-C: "It tastes like a carbonated $2.99 breakfast special. Like someone took your cheap bacon and got cheap maple syrup all over it." The K-i-C is now recoiling. She regards the creation with fear and loathing. Mad? MAD, you say? They called me mad at Oxford, too! But I'll show them! I actually kind of like cheap diner food, which may explain our difference of opinion. It may be that this tastes good only in contrast to how it smells and how I expected it to taste, but the fact remains--it's kind of good. Kind of not, too--it manages to feel greasy, and the contrast, while interesting, is not entirely a good thing. I wonder if a buttered pancake soda is possible? I will provide ratings as if this were a soda we purchased, but as a Lab creation, we will regard this as ineligible for inclusion on any lists. Quaff rating: 3.0. Interesting, and surprisingly good. Cough rating: 2.0. The smell and initial taste did make me pause and close my eyes. ** Which, I am told, is actually an acceptable archaic pronunciation for the word. So there. One hazard of Weird Soda reviewing is that all that sugar--that lovely cane sugar, or the lesser high-fructose corn syrup--carries a significant number of calories. Those calories have led me, the Quaffmaster, to possess a certain amount of excess abdominal infrastructure*. Thus, it would behoove me to investigate the less energetically-enhanced varieties of Weird soda. In fact, one might even say that producing sweetness without sugar is inherently a Weirdness-enhancing endeavor. Doing so with an herb such as stevia (which we grow in the Lab backyard) is an odd thing, but we must not flinch from such a thing. Stevia produces a very sweet taste, with an odd set of accompanying flavors. It always feels to me to have a certain amount of bitter undertone. Not enough to be unpleasant, but it can alter tastes. We've reviewed another offering from Zevia (one of the leading stevia soda canners), their Black Cherry flavor, which did well with the unique flavors of stevia. However, tonight we will put Zevia to the test. They have dared the highest peaks of sodadom, and released a cream soda. The Zevia cream soda, next to some fancy bread. Cause we're fancy folks. Readers of this blog will probably be aware of my love of cream sodas. "Passionate" would not be an excessively strong description. Can this stand up to the giants of cream? Let the tasting begin. Where and when: Purchased at Whole Foods, Encinitas, CA, in July 2011. Color: A moderately dark amber. Just a bit darker than a lager, and a tiny bit more orange than most urine. Scent: Pretty clear vanilla cream, no hint of herbal or bitter. A typical sharper/sweet vanilla--the french vanilla, rather than bourbon vanilla, style. Taste: The vanilla is quite strong, almost too much so. This is not a subtle cream soda; this vanilla steps up in a ten-gallon Stetson, says "Howdy", and sells you a used Ford. The stevia herbal flavor is all but buried. It does poke through a bit, like tall grass through rusted floorboards, but it's actually kind of nice with the vanilla. Lends a bit of interest to the low side of the taste. Could almost taste metallic, but doesn't. As a strong french-vanilla style cream soda, this is actually pretty good. Not the best I've ever had, but not bad at all. I prefer it to most other stevia sodas I've had. I pronounce this a worthy cream soda, of the slightly Weird variety. Quaff rating: 3.5. I'm giving it a bonus for the interesting interaction between the vanilla and stevia. Cough rating: 0.5; almost overpoweringly sweet. *I'm sure that the occasional** visits to Jack-In-The-Box have NOTHING to do with it. **The word "occasional" is not, in this case, meant to be taken as a statement of fact. Once more the global reputation of the Weird Soda Review Lab has brought us a windfall. Undoubtedly drawn by the impeccable credentials of the Lab as a bastion of scholarship, unimpeachable integrity, and enthusiastic Weirdness, the Sioux City company (whose birch beer and sarsaparilla we have previously quaffed) have sent us their latest concoction, Prickly Pear. Prickly Pear is, of course, a cactus whose fruit and flesh (as nopales) are edible. I am going to presume that this soda is based on the fruit, and that the spines have been removed. In addition, since I have recently been volunteering as a stagehand at Vista's "Moonlight Ampitheater", I will write the rest of the review in iambic pentameter. A sample, which we now shall quaff and rate. The essence of its fruity scent within. Tart berries war with citrus, scent on scent. A mellow note alloys the sweet and tart. Reports the smell as "Cherry!" and seems glad. perhaps a lime, and berries at the front. Within lies any horror unforeseen. Is pear and berries, citrus comes in strong. Raspberry! That's the flavor I detect. "Quite tart!" the Lead Assistant says (and true). Declare their joy in quaffing Prickly Pear. The aftertaste is not what I desired. If only it had mellowed at the end! This soda is not one to fear or shun. The others in the Lab enjoyed the taste. But not half bad. I'd drink this down again. A 3.5 would best describe the taste. But not among the best I've ever had. To rise; I found it drinkable enough. Inspires a nought-point-five; no more is just. Well, there you have it. Sioux City has produced a pleasant cactus-flavored soda. Really, fruit-flavored is a better description; raspberry is by far the strongest feel it gives.